Instant Knockout Reviews - Is it a Scam or Legit? Instant Knockout is a nutritional supplement that’s claimed to use all-natural ingredients to help increase your metabolism and reduce hunger cravings. Instant Knockout claims to be a 100% natural fat burner that uses extensively researched, clinically proven, plant-based ingredients to provide 3 primary benefits: a boosted metabolism, reduced hunger cravings, and increased energy levels. Instant Knockout is claimed to have been originally developed for pro MMA fighters to cut weight before their weigh-ins, but is now available to help anyone who wants to maximize the number of hours their body burns fat, while still retaining muscle. Whether you’re a serious athlete, are carrying around a bit of extra weight from the Holidays, or you’re looking to take your fitness up a notch, Instant Knockout claims they can help you “get a ripped, fighting fit physique” and a body you’re proud of, so that you can look good with your shirt off. And when it comes down to it, isn’t that why you want to lean up? Not only does Instant Knockout claim to help you accomplish this, but that you can still experience fat loss even if you don’t work out regularly. Double whammy, right? But instead of leaving you on your own to make a decision, we’ve researched Instant Knockout’s ingredients, and here’s what we learned. 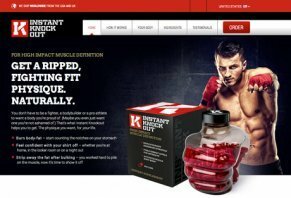 According to the Instant Knockout website, their formula contains ten completely natural, powerful, plant-based extracts, vitamins, and minerals that are 100% safe, and that can help you slim your physique. However, WebMD claims that there is insufficient evidence showing that Vitamin B6, Vitamin B12, zinc, chromium, green tea extract, green coffee bean extract, cayenne powder, or caffeine can reliably boost metabolism or help you lose weight. This isn’t to say that these ingredients can’t provide you with some health benefits, but it’s unlikely that they’ll help you trim up and lose excess belly fat. However, by making you feel fuller by adding a great deal of dietary fiber to your diet, glucomannan may help you eat less and therefore lose weight. However, it will not directly help you shed pounds, and it’s very likely that the effect will only be minimal. WebMD recommends not taking glucomannan regularly for more than 4 months. Other than this, WebMD also claims that Instant Knockout’s ingredients are generally considered safe in the recommended doses, although everyone’s body is different, so you may react differently. A note about clinical evidence: As we can see, there is a lack of substantive clinical evidence within the scientific community showing these ingredients work, but this doesn’t mean clinical studies haven’t been performed on them. How Should Instant Knockout Be Taken? The manufacturer claims that you should take 1 capsule of Instant Knockout, 4 times per day: one in the morning, one before lunch, another in the afternoon, and a final capsule before your evening meal. As such, Instant Knockout is claimed to be completely safe to take on a daily basis. However, because of the stimulants contained in the supplement, the company recommends not taking any other stimulants throughout the day. Also, in order to avoid sleeplessness, the manufacturer recommends taking your last dose of Instant Knockout no later than 5 hours before bedtime. Is Instant Knockout the Best Way to Lean Up After Bulking? According to this Houston Chronicle article, the best way to lean up after bulking is through a calorie-restricted diet, increased cardiovascular exercise, working out each of your muscle groups regularly, and consuming adequate amounts of protein. And while it might seem intuitive that a natural supplement can help boost these effects, as we mentioned above, the evidence supporting Instant Knockout’s is very slim. With this said, like any other athlete who has to weight in, MMA fighters are some of the most weight-conscious professionals around, so it would go a long way toward adding credibility if a well-known MMA fighter endorsed the product. However, we couldn’t find any online material that linked Instant Knockout with an MMA fighter. There weren’t any online customer reviews available for Instant Knockout at the time of our research, other than affiliate websites that feature fake reviews. It’s interesting to note that most of these websites posted Instant Knockout reviews at the same time, between the end of September and the beginning of October. We did learn that the supplement is manufactured by Roar Ambition Ltd based out of the UK, who also makes TestoFuel. Performed regular weight lifting exercises. Eaten a consistently healthy and rich calorific diet. Finally, you’ll need to send your package as signature required. And after it’s all said and done, the company will still subtract a whopping $35 admin fee, as well as S&H costs, from your total refund amount. Unfortunately, there’s no customer service phone number available for Instant Knockout, only an email address at cs@instantknockout.com. Can Instant Knockout Help You Look Better with Your Shirt Off? Chopping to the Point: Considering the lack on online clinical support showing the efficacy of Instant Knockout’s ingredients, the highly restrictive refund policy, and the fact that you can lean up without the use of supplements, we’d recommend speaking with a physician or dietician about more effective methods of shedding excess weight. This product has not done anything it says it does. I have taken it for three weeks with no increase in energy and absolutely no weight loss. I am an active person who works out five days a week with a healthy diet and this supplement did not help one bit! I contacted customer support for a refund. They told me the refund was only for a three-month supply, not a one-month purchase. Their 90-day money back guarantee is false advertisement! Do NOT buy this product! It's a waste of hard-earned money! I purchased a four-month supply, thinking if it didn’t work, no big deal I would get a refund. WRONG! The refund timeframe starts from when the product is delivered, which is great if you start it then. I contacted the company around 70 days of being on the product because it didn’t seem to be working for me (I thought the return policy was "return within 90 days for a refund"). I was told you have to use the product for 90 days BEFORE they will issue a refund. Ok, so I figured I would contact them again when I was finishing up my third bottle. Well, I missed a pill here and there and that added time to my third bottle, no biggie right? Yeah, well, since I didn’t start the bottles right away when I received them because I wanted to start on a specific day, that added to my time and when I contacted the company again after my "90 days," they informed me that the time frame for a return is after 90 days from delivery but before 120 days before delivery. I missed the 120 days by a little bit and was refused a refund. You only have 30 days to contact them, hear back from them and arrange the return. SCAM. They don’t stand behind there product, and they make the return process really difficult and misleading. The first time I contacted them for a refund and was told I needed to be on it for 90 days they should have mentioned the 120-day cut off period. Instead they lead me to believe I had time. Crappy company. Crappy product. Crappy customer service. Don't bother, save your money. I purchased a bottle and didn't lose anything. I watched my diet, got some exercise, more than usual, and there was no weight loss. I went to get my refund, but because I ordered and didn't start the plan for a few weeks after receiving it, I had surpassed the 30-day money back guarantee. That's kind of a crappy policy, that it has to be returned within 30 days of invoice date. I had ordered two boxes of Instant Knockout through PayPal and without asking for the delivery address it picked up the billing address, which is my home country. The same day I informed them of the mistake and they initially said that I had to reject the parcel from my home country. Later they said that they will have to wait for the shipment to return and only then will they deliver to my residence address. It is a waste of money, it doesn’t work. Instead, I got heartburn and sleepless stress. When you call them, they will ignore you. Once they get their money, you will never get a refund. The 90 days refund is rubbish and a scam. Be careful, don’t waste your time and money. I was a one-time buyer. I think I ended up buying it deceived by the strong marketing campaign this product has. It's what you can see on the company's website. However, I realized the product does not work at all and I decided I would not buy it again. The product is expensive in proportion with the amount, and last but not least, because you do not feel any of the benefits you are supposed to receive, like losing weight easier (it doesn't boost your energy levels either). I felt restlessness, anxiety and I could not sleep. They didn't give me back what I paid for a product that caused me losses and bad health consequences, so that read thoroughly their policies if you want to take the risk. I felt very disappointed about Instant Knockout, so I decided to share my experience with people interested in this product. I bought this product thinking that I had nothing to lose. WRONG! 1) 90-day guarantee only applies to purchases of three boxes or more and they refund you everything minus $35 and whatever you have to pay in shipping. 2) It didn't do anything for me. I kept working out and eating right then added the pill and felt absolutely no change. 3) When you request a refund, they will ignore your first contact so be prepared to have to contact them again. 4) You can't call them because they are located in London and don't answer the phone. 5) The only thing they are guaranteeing is that they are making money whether you like the product or not. Hopefully, this reaches enough people that it helps someone avoid the same pitfall I fell into. After ordering Instant Knockout, I waited until the next day to take the "recommended dose." After taking the four daily capsules, I became nauseous and had very bad heartburn and felt uneasy jittery. The next day I contacted only through email because there is no phone number for customer service. I was told by Joanne that per the company terms and conditions that I could not get a refund. She said it was "very clear" in the terms and conditions page. Bottom line, do not order this product. It is nothing more than a scam to deceive you out of your money. She was no more concerned about my experience than the man in the moon. Save your hard earned money. Before buying this product, I searched and searched the internet for reviews, and of course, all I found were reviews on how amazing this product was. That was me SOLD. I was excited and could not wait until it arrived. In fairness, I have only been taking the pills for about three weeks, but there is no difference. Nothing; "sweet Fanny Adams." I am overweight (19 stone) and need all the help I can get, and I was hoping this was something that could help me shift a few pounds as well as healthy eating and working out hard in the gym. I promise you, don’t buy this product, it’s expensive nonsense. However, I will say that two weeks before buying Instant Knockout, I bought Roar Ambitions 4gauge pre-workout powder and it’s amazing. It does work. But as for Instant Knockout, it’s a hard lesson learned. I purchased the 3-month supply to get the 1-month free and am throwing it out after 2 months. I've increased my workouts and have gained 8 pounds over the past 6 weeks, mostly fat. I would be fine with not changing at all, but this product appears to have me going backward. I'm too embarrassed to ask for a refund. Exact same experience. I've just written a letter of complaint to the CMA. I believe they work for me. Now I was rather dubious of purchasing items like this as 1) it is pricey and 2) reviews I found online seemed to be promotional ones where the reviewer is even wearing an instant knockout T shirt, and that did not seem impartial. So after taking the plunge, I took the prescribed dosage every day. Now I started my weight loss six weeks ago and have been taking Instant Knockout for four weeks. Also, I am on a high protein and low carb/low fat diet (which always makes you feel hungry). I have gone from 109 kg to 104kg from a mixture of the high Protein diet, 30-40 minute cardio and 30-minute weight lifting sessions six times a week and taking Instant Knockout four times a day, with only three days of non-pill taking. I have seen a visible difference in losing fat, my belly fat is no longer solid and jiggles about, and my clothes are becoming extremely baggy and have had to purchase a new belt in the last four weeks. The only major downside to these supplements is that they do not make me feel full in the evenings. This has been from the start of this regime, it's something I have battled with and trust me, I am still struggling with it. And after four weeks, trying to fall asleep at night is becoming a nightmare. I am taking my final pill earlier now to try and settle, but my body wants me to head back to the gym, becoming frustrating. Bar the side effects I am suffering, still hungry and lack of sleep, I feel it really has been helping to shift my excess fat. I have just purchased a second month's worth to help hit my goal of 100kg. Write a Review for Instant Knockout!